Santa Cruz, Bolivia, 03 Ago. ABN.- “We have to liberate ourselves economically in order to have political power” Bolivian president Evo Morales Ayma told representatives of the indigenous originary campesino peoples and social movements that had congregated at a mass event in Camiri last Sunday to receive the Law of Indigenous Autonomies. “We are still not free and independent in economic terms, in some regions, in some departments, there is a total dependency on private business, on private agro industry or in the area of services”, recalled the head of state, according to the Bolivian Information Agency (ABI). “When we finally liberate ourselves economically, that is when the people will have the power” he added, comparing the fact that other groups have power due to their control over territory, land, and the economy. 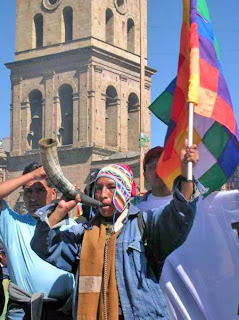 Morales asked the members of the Unity Pact, the leaders of “Conamaq (National Council of Ayllus and Markas of Qullasuyu), of CIDOB (Confederation of Indigenous Peoples of the Bolivian East), of the CSUTCB (Single Union Confederation of Campesino Workers of Bolivia), the denominated intercultural comrades, and the other departmental leaders, to raise the consciousness of the social movements so that the social movements, indigenous campesinos and all sectors have economic power”. “Only when we have economic power as peoples will we have real political power, for that we need a higher level of consciousness, of reflection and orientation so that this process of change cannot be stopped” he demanded. He said that it was not enough to just recuperate natural resources and that the other goal, although difficult to achieve, is the self-organisation of the social movements. Morales asked himself where has the state been during the 180 years of republican life, recalling that it had not been present in the indigenous communities, that is why he highlighted the importance of the implementation of indigenous autonomies.